I have been offline for most of last week and have not been updating my blog because I have been trying to avoid certain areas of my house. Because there is a flea infestation that I am still trying to adapt to. Best part is... the most badly affected area is the carpeted area where my internet connection is. Bring chair to aforementioned carpeted area. Sit down for 60 seconds with both feet firmly planted on ground. Look away from computer monitor & focus on the veiny areas of foot. Look for suspicious tiny black dots on yellow skin. Open eyes wide in surprise & horror. Use fingers to, one by one, pluck the 5 or 6 black dots discovered. Kill each flea by rolling between fingers HARD, stabbing with nails HARD or swallowing HARD. Best way to kill fleas with your hands is by rolling them between two fingernails. That is... if you get to hold those little jumpy b*****ds long enough to roll over them. Here is what I have learned regarding cat fleas from the internet, a vet & a doctor. My house has been infected with cat fleas. This type of flea is the most common of all fleas & they can be found on both cats & dogs. I suspect that one of them (or maybe even a colony) got onto one of our 3 cats & hitched a ride into our apartment. Once they got here, they started to reproduce & soon infested the whole area. As their population increased they started feeding on the larger creatures... humans... ME! I thought that cat fleas only bite cats? My housemates & I are living proof that they DO but HUMANS! Basically fleas are like heat-seeking missiles. Cat & dogs have a higher body temperature than humans. Therefore, when there are cats or dogs around, the fleas will go after them. In our case, we inhabit two apartments on the top floor of our building. The cats hangout in both apartments but they are usually at the apartment where there is no internet connection. Therefore, the fleas at the latter location will have to make do with another source of blood... human blood. The good news is cat fleas cannot reproduce with human blood. Therefore, the whole colony will die off without any descendants, if they rely solely on human blood for nourishment. What happens when a flea bites a human being? Excessive flea bites on cats, dogs or humans can cause flea allergy dermatitis. 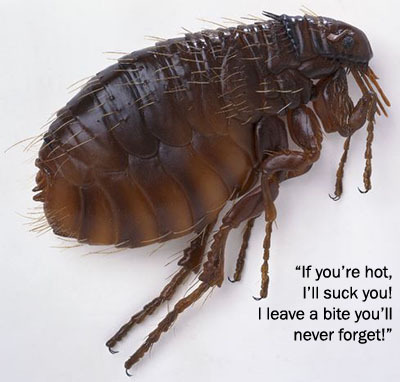 Although rare, it will happen if flea infestations are left untreated. We should also worry about the special ability of fleas to spread parasites & infections. The main worry is tapeworm infestation. Flea bites may infect mammals with tapeworms which feast on our insides while their bouncy comrades feast on our outsides. The main problem with flea bites is the itchy red lump it leaves behind. oh & believe me... IT IS SOOOOOO ITCHY!!!! and it feels SOOOOO GOOOOD to scratch. It would be just fine if only one flea bites you. That would be comparable to a mosquito bite that many have grown accustomed to. Because once one of them comes for makan, it will invite all its family & friends to this open house! An open house on YOUR BLOOD! What did I do to deal with the fleas? The first thing I decided to do was get the fleas off the cats. Then, the fleas will die off without a source of reproductive nourishment. Fleas can exist at a given location for up to 365 days because of the eggs that are waiting to hatch & the larvae that are waiting to grow up & start sucking blood. Thankfully, I wont have to wait that long. I'm leaving the hostel in 2 months. How do I get the fleas off the cats? My vet says that a flea spray is the best treatment against fleas. So I use a flea spray on the cat's body & flea powder on the face. Any brand will do but bear in mind that the costs are quite high. My large 250ml bottle of Frontline costs RM64 from a government vet. A bottle of flea power will cost around RM20 from your local pet shop. Bear in mind that these items can be used over 1 or 2 years. How do I cope with flea bites? My problem was with cat fleas. If you have a different kind of flea affecting you, look for the specific treatment for that specific flea. It is important to consult your physician about your problem. I am not certified to give you advice on this. But I can share with you my experience & how I coped with my problem. It worked for me but may or may not work for you. My main treatments was to avoid the apartment where the fleas are biting humans. This has helped my existing bite wounds to heal & also effectively prevent more lumps to surface. Also antihistamines & soothing ointments, like Minyak Gamat (Sea Cucumber Oil) & Zambuk, worked to relieve the itchiness. Realising that the carpet is their favourite hiding spot. Both apartments were vacuumed & had generous amounts of flea power spread in it. Also I noticed that they are not very active at night. Few of them jump onto my feet for a feast during the night. Fleas are very sensitive to temperature so I guess they are dormant when temperatures are low. Therefore, you will only see me online at night. A doctor was consulted on the bites & cat fleas were the confirmed culprits of the bites. This was determined through the pattern of the bites being mainly around the feet & only moving higher when ointments or pesticides were used on the feet. We were advised to keep our feet 'open-air'. Enclosing our feet in socks or shoes will only give the fleas an easier time at sucking our blood. These bites are not serious nor fatal & will heal. Now you know most of what I know about cat fleas & how to cope with them. If you have anything to share or corrections to make, do contribute with a comment. Now, I'm gonna escape from them blood suckers!